Ages 13 through adult. 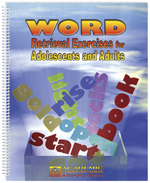 Use this book to build word-retrieval skills in clients with language impairments resulting from brain injury. Clients are asked to define words, state opposites, name words with specific characteristics, complete sentences, describe events in detail, etc. The activities may be reproduced for distribution to clients and their caregivers. The book is divided in to two sections. Exercises for Language Stimulation This section includes a variety of activities to stimulate language production. Clients are asked to label pictures, classify nouns, give opposites, and perform other tasks that require precise responses.